In the past 2 weeks we have seen ice conditions drastically improve for lake travel. Auto travel is done but you can still access the lakes via ATV, UTV and snowmobiles. Some lakes do have some slush under the top layer of ice but for the most part, the lakes have sealed up with the cold temps at night. The best part about those low temps is they are keeping the accesses sealed as well. As for the fishing, absolutely incredible covers it. We have had days of catching 100s and days averaging in the 12 inch mark with a few giants coming though the hole. Sunday may have been the greatest big crappie day I have seen since my teens. It is most definitely the best I have seen since my pilgrimage to the BLA. 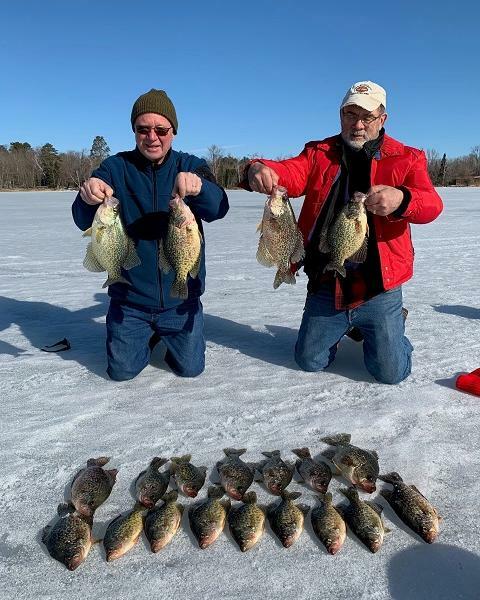 That day, we had 25 fish from 14 to 16 inches and the biggest crappie weight wise I have seen since my father popped a 2-8 when I was 15. Grabbing that fish as it came up the hole made an image I will never forget. Simply incredible to say the least! Techniques really depend on the lake. Most lakes we are having the best results using a Clam Drop XL with a Maki tail. This time of the year, I tend to go with bright colors like chartreuse or with straight white and this year is no different. Horizontal presentations this time of the year are most definitely the better option although some bigger jigs tipped with waxies in a vertical presentation have also been working well. Other lakes, the ticket has been using dead sticks and minnows. Several techniques do work but far and away the best I have seen is taking a #6 gold Aberdeen hook, hooking the minnows through the eyes. There is a gap in the minnows eye sockets that lets the hook travel right through and it does not injure the minnow at all. Maybe the most important part of the dead stick technique is not to use too heavy of line or one the fish can see with ease. Three pound test fluorocarbon is my first choice while doing this technique. The night bite has really improved for crappies as well with the best bites running from 8-midnight and minnows on a glow jig below bobbers being the best technique. Bluegill action is also on fire and they are in very shallow water and really putting on the feed bag. This time of the year, don’t be scared to really up your jig size. This will do 2 things: increase the size of your catch and decrease the amount of little fish you have to deal with. Perch are biting everywhere as they near their spawn. We are finding perch in areas just off the weed lines in 10-12 feet as well as some fish shallower near reed beds but one thing is consistent…horizontal presentations and plastics as well as jigging spoons tipped with a minnow head. The fish are staying really close to the bottom so pounding the jig on the bottom can really bring in the fish. Another little trick that I will pull out from time to time is ripping a musky sized lipless crank bait to bring in the perch. They are really curious so many times, the more noise you can make, the better you do. We should have a couple more weeks of getting on the ice if the shorelines keep holding up but just as always use extreme caution and it may be time to bring out a life vest, ice picks and a spud just to be safe. Good luck and get out there and enjoy the Brainerd Lakes!